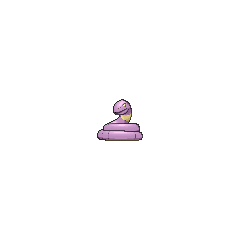 Ekans in game: 3,671 Who? Important notice! Pokemon Ekans is a fictional character of humans. 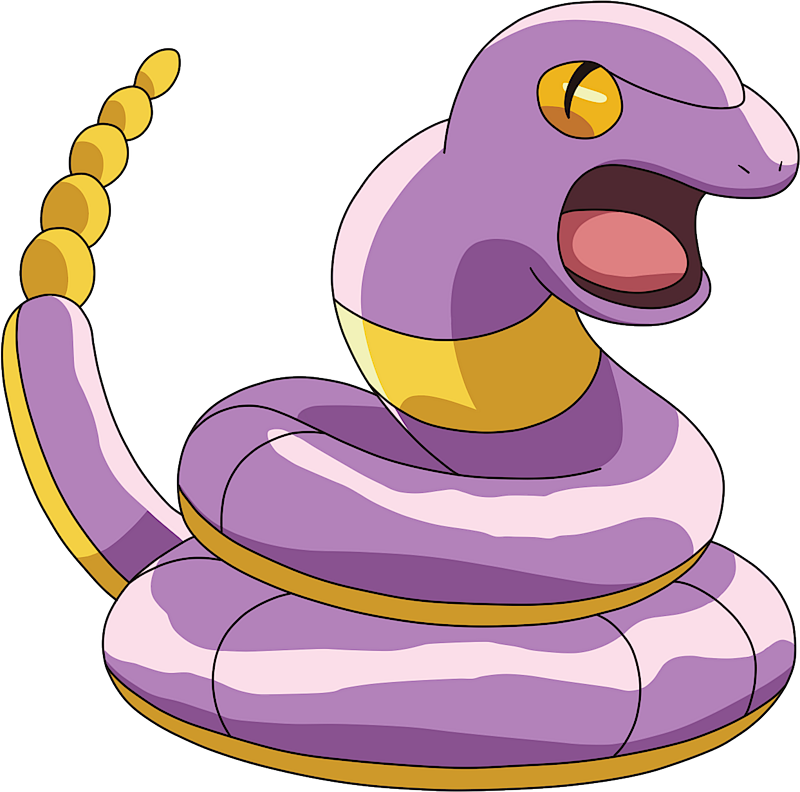 Ekans is a purple, serpentine Pokémon. Its eyes, underbelly, the thick stripe around its neck, and rattle are yellow. Ekans has three pairs of black lines encircling its body, as well as another line that connects each slitted eye and curves toward its nose. Its large mouth has a round, pink tongue and no visible teeth. While painful, a newborn Ekans's bite is not venomous. This Pokémon grows longer with age. Ekans lives in grassy savannas and plains, where moves stealthily through grass. It preys on Eggs from Pidgey and Spearow nests, but can strike other prey from behind. By flicking its tongue out, it is able to detect danger and the scent of prey. Its jaw can detach to swallow large prey, but such a meal can make Ekans too heavy to move. It wraps itself around tree branches at night to rest. If not in a tree, it will coil itself up—a position in which it can defend itself from all directions. It was also shown in the second movie to possess some swimming abilities. Its former signature move is Glare. Jessie had an Ekans, which for most of the original series, was her only Pokémon. It was extremely loyal to her and eventually evolved into an Arbok just to make her happy. 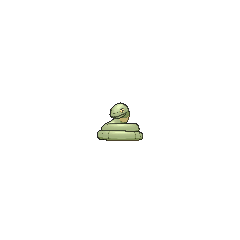 Ekans was part of Team Meanies in Pokémon Mystery Dungeon: Team Go-Getters out of the Gate!. Gengar commanded the Poisonous Snake Pokémon to eat all the Berries Team Go-Getters collected. 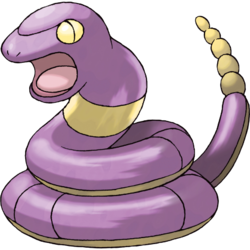 At one point, Ekans was incorrectly referred to as Arbok by Gengar. While this was an intentional error that Ekans rebuked in the original version (due to the similarities in the Japanese names), this came across as a general mistake in the dub and was corrected in reairings of the episode. A poacher had captured a bunch of Ekans in A Poached Ego!. 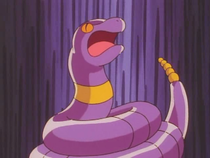 An Ekans appeared in Mewtwo Strikes Back. Multiple Ekans also appeared in The Power of One. An Ekans was one of the sick Pokémon in a Pokémon Center in Carrying On!. Ekans made a cameo appearance in Different Strokes for Different Blokes. An Ekans appeared in SM003, as a silhouette. Ekans first appeared under the ownership of Koga appearing on his arm in Go for the Golbat. An Ekans appeared in a flashback in Growing Out of Gengar where it was driven away from its home after the Power Plant had been abandoned. Harry of the Team Rocket Elite Trio also has one which first appeared in The Coming of Slowpoke (Eventually). 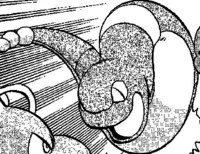 A Team Rocket Grunt in Johto owns an Ekans in Sneasel Sneak Attack. 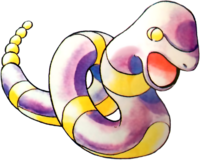 An Ekans was also one of the Pokémon pitted against Gold when he offered to help out at the Day Care near Goldenrod City in Quilava Quandary. When Emerald was young, an Ekans helped him with his disabilities, shown in The Final Battle IV. An Ekans was originally going to be featured in Pokémon Snap, shown in an early test shot of an environment that was never featured in the final product. This is also true of its evolution, Arbok.